Aviv Kochavi is second of three children born to Shaul and Riva Kochavi. His father was a shop owner and his mother was a physical education teacher. He grew up in Kiryat Bialik in the Haifa District, studied at the Habonim School in Kiryat Bialik and in the Ort Kiryat Bialik educational school and was a member of the “HaMahanot HaOlim” youth movement. Kochavi was drafted into the IDF in August 1982, volunteered for the paratroopers, and was assigned to the 890th Battalion. In the following years he assumed command of a platoon and served as the battalion operations officer. He completed his BA in philosophy at the Hebrew University and was subsequently appointed as the Operations Branch Commander of the Paratroopers Brigade. In 1993, Kochavi was promoted to lieutenant colonel and served in the post until 1994. In 1995, he was appointed commander of the Paratroopers Brigade and served in the position until 1997. He served as deputy commander of the Paratroopers Brigade between 1997 and 1998. In 1998, after completing his master’s degree at Harvard, he was appointed the commander of the Eastern Division of the Liaison Unit for Lebanon. In 2001, he was appointed commander of the Paratroopers Brigade, where he served until 2003. During Operation Defensive Shield that year, Kochavi successfully led his Paratroopers Brigade to capture the Balata Refugee Camp in Nablus. He developed a new tactic that involved breaking through the walls of residences rather than enter through the front of buildings where soldiers could be targeted by snipers. The tactic was later adopted by the U.S. military in Iraq and Afghanistan. In 2003, Kochavi was promoted to the rank of Brigadier General and was appointed Commander of the Fire Brigade. He served in the position until November 2004. On November 30, 2004, he was appointed commander of the Gaza Division. During his service as division commander, two major events took place: the disengagement in September 2005 and the abduction of Gilad Shalit in June 2006. After spending time and the United States and earning a second master’s degree in international relations from Johns Hopkins, he returned to Israel and was appointed head of the operations directorate where he served from 2007 until 2010. In 2010, he was promoted to the rank of Major General and appointed head of Military Intelligence. In 2017, he was appointed deputy chief of staff and served until December 13, 2018. On January 15, 2019, he was promoted and began his service as Israel’s 22nd chief of staff. Kochavi is married and is the father of three daughters. 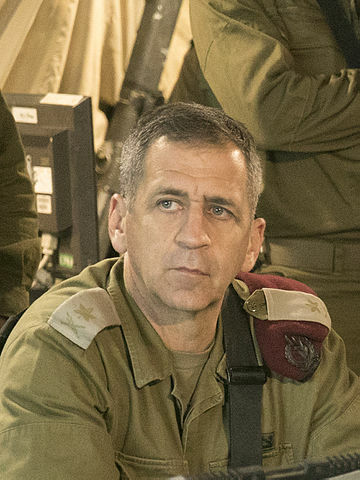 “Who is Major General Aviv Kochavi?” Arutz Sheva, (October 26, 2018).